In the 1980's, context became the architectural buzzword. Here, the developer and architect clearly heeded the theme and took definite notice of its large neighbor to the north across the street, Citicorp Center (see The City Review article on that tower). 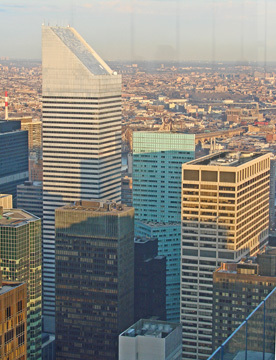 When Citicorp Center, shown at the left in the photograph at the left, was erected in the previous decade, it defiantly ignored its environment and contemporary urban design common sense by raising its tower on stilts, employing an irregular form and reviving, rather successfully, the often vilified sunken plaza. This new mammoth, 47-story office tower paid homage to Citicorp Center by creating a large, triangular plaza to broaden the southern approach to Citicorp Center and played with the same angularity in its setbacks to enliven its skyline appearance. Although its roof is flat, unlike Citicorp Center's slanted top, this tower's form and its horizontal fenestration pattern well complement Citicorp Center even if they do not significantly mitigate its ungainly bulkiness. Strongly to its credit, however, is the slanted, glass-enclosed entrance to the subway station in the middle of its triangular plaza, the best new subway entrance in decades in the city. The glass wedge canopy floats above a circular base and is an appropriate outdoor work of art for the buildings large plaza. The circular base also provides seating for the plaza. Moreover, the immense, well-lit lobby, shown below, fronting on the plaza represents the best of mainstream corporate design in its conservative endorsement of art and rich materials. It rises above that level, though, because it makes the very nice, public gesture of letting it be visible, very visible to anyone who passes by, even, and especially, at night. The art in question here, shown below, is an enormous painted sculpture by Frank Stella, one of his best works and its setting, exploding out from the south wall of this marble room, banded in blue-green and white, is terrific. This is not static, but electric, energizing art that is best suited for exactly this kind of space. The entire north lobby wall, opposite the Stella, is glass so that at night when the lobby is lit the art is like the molten heart of a volcano, which is most welcome here directly opposite the usually dirty but silvery facade of Citicorp Center. In his book, "Privately Owned Public Spaces The New York City Experience," (John Wiley & Sons, Inc., 2000) Jerold S. Kayden correctly notes that "although not a public space, the private lobby nonetheless engages the passing pedestrian," adding that "visible through the glass-walled, two-story arcade is a colorful Frank Stella artwork, entitled Salto Nel Mio Sacco (1985), adorning the lobby wall." "Such transparency into normally invisible lobbies and the intent ot display art for passersby as well as building tenants can, as here, greatly enhance the experience of the exterior public spaces," Kayden wrote, making an excellent point. The lobby and its Stella also go a long way, especially at night to excuse the putrid, pale blue-green facade of this bulky tower, one of the worst color selections in the city's facade history. Nevertheless, the developer and the architect should be praised for attempting to add to the citys palette and the facade is nicely detailed. The alert staff at the concierge/security desk, discretely placed at the west side of the lobby, do not permit photographs inside the lobby. Of course, the glass walls ease the urban photographer's problems. A slimmer, more silvery tower with a roofline slanted in a different direction than Citicorp Center's would have been a better corporate office showcase. Citicorp Center's owners should probably pay Boston Properties a handsome "light-protector" and "good neighbor" fee for its generous, deferential architectural gesture. By itself, 599 Lexington Avenue is less than beautiful, despite its marvelous lobby and street-level urban design treatment. But as an unofficial expansion of the Citicorp Center enclave of rakish modernity it deserves good marks, certainly far better than the official expansion of Rockefeller Center across the Avenue of the Americas back in the 1960's.